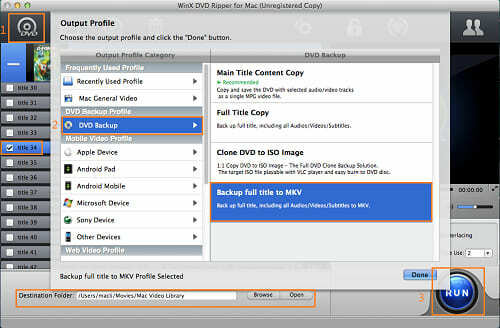 How to Decrypt DVD on Mac? Try the Following Top 3 DVD Decrypter Software for Mac! DVD distributors always attach strict copy protections on DVD movies, TV shows and more to restrict backup and reproduction for unfair use, which push a lot of DVD owners, who would like to rip DVDs to digital files in order to preserve DVD contents longer or play with portable devices, to dig out helpful DVD decrypter software. If you are a Mac user and demand to decrypt a copy protected DVD with great output in shortest time, top 3 best DVD decrypter for Mac of 2019 introduced here can cater to your needs. Everyone has own standards to pick up a DVD decrypter for Mac but some common points must be fulfilled. Primarily, the strong ability to rip protected DVDs, no matter what encryption is used for the DVD. Secondly, user-friendly tool with concise interface and easy operation will be welcomed. Thirdly, the valuable software can deliver a fast ripping speed. In consideration of above-mentioned requirements, we conclude best 3 DVD decrypter software for Mac below. WinX DVD Ripper for Mac is a powerful DVD ripper specialized in converting any DVDs to overall mainstram formats and devices, be it MP4, MKV, HEVC, AVI, MOV, iPhone, iPad, Android, Windows Phone etc. It is ranked top on the best DVD decrypter for Mac chart since it can remove various copy protections including CSS, region code, RCE, Sony ArccOS, UOPs as well as support latest protected DVDs released by Disney, Paramount, Warner Bros., 20th Century Fox and more thanks to weekly updates. In addition, Hardware Acceleration, High Quality Engine and advanced Hyper-threading Tech, Multi-core Utility can deliver a high level of resulting video quality at the fastest speed. 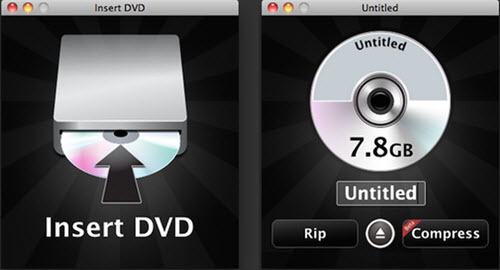 RipIt is a Mac DVD ripper pushed out by The Little App Factory. Working well on discs encoded with CSS, Sony ARccOS, Macrovision RipGuar and other protections, it wins the reputation as one of the best DVD decrypter for Mac. It can quickly convert DVDs in two modes. One is to back up all DVD contents, the movie video, subtitles, tracks, extras etc, to Mac computer and the other one is to compress DVD to a digital file for playback in iTunes or on iPhone, iPad, iPod, Apple TV. Also, the blindingly simple operation saves new hand, who even has zero knowledge about DVD, lots of energy to decrypt and copy a DVD. What's a pity that RipIt lacks of an option to bypass region code of DVDs and doesn't allow users to extract particular chapters from a DVD. As an effective replacement of famed MacTheRipper, Mac DVDRipper Pro boasts its ability to make playable copy of CSS-encrypted DVD to hard drive, iTunes (M4V), iPhone, iPad, iPod, Apple TV etc, on Mac. It also acts as a DVD burner available to burn the main movie of original DVD with removal of copy-protection to a new blank DVD. During DVD ripping process, you can use this top DVD decrypter software for Mac to cut unwanted parts (trailers, ads etc.) and turn on/off soft subtitles. 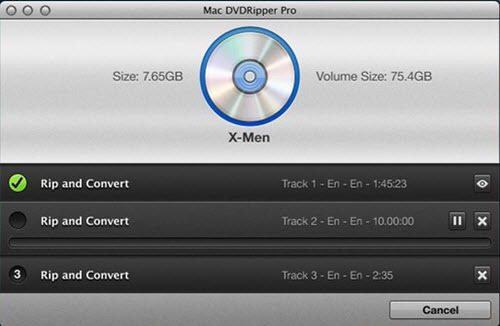 Although Mac DVDRipper Pro offers up to 99 ripping actions meeting the demands of numerous users to convert/decrypt DVDs on Mac, it's not a good choice if you want to convert DVD region code because of the partial support. Verdict: On basis of the above review of top 3 DVD decrypter for Mac in 2019, we can conclude that WinX DVD Ripper for Mac is the most worthwhile software for DVD decrypting on Mac due to it is compatible with more OS versions, supplies more input/output profiles and supports versatile DVD copy protections. Can't Play/Read/Decode DVD? Solve It in 5 Minutes! Can't play DVD on Windows or Mac since your DVD disc is not decoded? Take it easy. The 'can't decode DVD' error will be solved easily with the solution right here. Reviews on the top 5 free DVD rippers for macOS: how to fast rip DVD to MP4/iPhone/iTunes/iMovie on Mac, convert and edit old and new DVDs. DVD decrypter on Windows 10 could remove DVD CSS, region code, RCE, Sony ARccOS, UOPs and even Disney X-project DRM to enhance your movie-watching experience.